Sciblogs | Is genetic engineering just like breeding? This stance is grossly misleading. Genetic engineering/modification, as defined in the international agreements governing it, was not even in existence before discoveries of the 1970s. Her misuse of language is an attempt to wave away people’s (and by this I also mean scientists’) concerns that the safety testing of this technology could be better, should be better, and must be more transparent and independent of the vested interests driving it (Editors, 2009, Pollack, 2009). What Federoff didn’t mention was that GE plants are protected by an intellectual property (IP) instrument called a patent (Figure). This is unprecedented in the history of agriculture and is fundamentally different to plant variety protection (PVP), particularly as described by the UPOV convention of 1978 (Heinemann, 2007), a convention subscribed to by most of the world (Heinemann, 2009). Throughout a large chunk of the 20th Century, breeders (and farmers) could innovate under the protection of PVP, which helped to foster the plant diversity behind the Green Revolution (IAASTD 2008). PVPs are different from patents because PVPs allow farmers and public researchers to continue to improve on varieties. They can save and reuse the seeds to breed to their conditions. It is seed savings coupled with local and regional exchanges that promote rapid dissemination of the most productive plants, which must be adapted to local conditions to flourish: to feed us, to build wealth and health, and to limit the impact of agriculture’s ecological footprint. That is why in the United States, which once had one of the largest seed savings and exchange communities, saving and sharing seeds in the major crops is now illegal (Mascarenhas and Busch, 2006, NDSU, 2007). Too much of a chance that some seed will have a transgene, and a transgene will have a patent (see box quote). The largest ever international study on agriculture for the future, the World Bank and United Nations’ report called the IAASTD (IAASTD, 2009), found this undermining of traditional seed savings and exchanges a potent threat to food security. ’In Wisconsin alone 90% of the soybean crop planted in 2008 was herbicide tolerant (USDA —ERS, 2008). Herbicide tolerant varieties are classified as patented varieties or possess patented genes. ‘If the variety is patented or has a patented gene, no seed may be saved for planting purposes and no farmer seed sales are permitted’ (Spears and Randy Weisz, 2004). Remember as a grower you agree to this statement when you accept delivery (legal statements are on the invoice and/or on the tags attached to seed containers). It is likely given the economic climate we are under that field monitoring procedures will be ramped up in 2009 to ’catch’ growers that plant patented varieties. It is also apparent that those growers that are caught will be prosecuted and fined to the legal extent of the law to discourage other growers from attempting this practice’ (Conley, 2008). Patent and patent-like PVPs, which are being pushed by the US through UPOV 1991 (although this is being resisted by some caring governments) and TRIPS (trade-related aspects of intellectual property rights), force farmers to knock on the door of biotechnology companies to restock every year (Adi, 2006, WHO, 2005). No user innovation is allowed, crushing farmer-lead innovation. Yield drag (Fernandez-Cornejo and Caswell, 2006) is one result, because no matter how big the biotechnology company is, it will never be able to breed useful traits at the scale and pace that farmers across the globe, acting in their small and distributed ecosystems, will spread those traits (Heinemann, 2009). And these companies wouldn’t even try. Why would Monsanto, Syngenta, Bayer and DuPont want to spend investor dollars producing seeds for extremely small niche markets in sub-Saharan Africa, the steppes of Asia, or a paddock in the Solomon Islands? But their patents give them ownership of germplasm and at a global scale, thus inhibiting any country that joins the World Trade Organisation from also conducting its own research and development of plants for food security. Even the World Bank has been uneasy with the concentration of the biotechnology industry (Table). *CR4 is a measure of the concentration of market share among four largest firms. The World Bank says that a CR4 around 40% signals a failure of the market to remain competitive (WorldBank, 2007). Only in the last decade have ’transgenes’, or ’biotech plants’ started to approach proportions of production where their patent and patent-like protections may pose a real threat to food security. In the US, for example, it is difficult and in some cases impossible to source the most important yield-enhanced varieties separate from those carrying patented genes. This isn’t because the transgenes increase yield significantly; it is because one transgene in a genome gives the biotechnology company control of hundreds of actual yield-enhancing genes that are not transgenes but are in the same plant. As a trusted advisor to the Obama administration, why not agitate for the removal of patent and patent-like PVPs as instruments for the commercial protection of GE products, thereby opening the doors to independent safety and efficacy evaluations? Until then, Dr. Federoff, don’t try to tell me that GE is just like breeding. Adi, B. (2006). Intellectual property rights in biotechnology and the fate of poor farmers’ agriculture. J. World Intel. Prop. 9, 91-112. Editors (2009). Do seed companies control GM crop research? Sci. Amer. August. Fernandez-Cornejo, J. and Caswell, M. (2006). The first decade of genetically engineered crops in the United States. EIB-11. U.S. Dept. of Agriculture, Economic Research Service. Heinemann, J. A. (2007). A typology of the effects of (trans)gene flow on the conservation and sustainable use of genetic resources. Bsp35rev1. UN FAO. Heinemann, J. A. (2009). Hope not Hype. The future of agriculture guided by the International Assessment of Agricultural Knowledge, Science and Technology for Development (Penang, Third World Network). IAASTD, ed. (2009). International Assessment of Agricultural Knowledge, Science and Technology for Development (Washington, D.C., Island Press). Mascarenhas, M. and Busch, L. (2006). Seeds of change: intellectual property rights, genetically modified soybeans and seed saving in the United States. Soc. Ruralis 46, 122-138. Pollack, A. (2009). Crop scientists say biotechnology seed companies are thwarting research. In New York Times (New York). WHO (2005). Modern food biotechnology, human health and development: an evidence-based study. Food Safety Department of the World Health Organization. WorldBank (2007). World Development Report 2008: Agriculture for Development. World Bank. I wonder how many realise what an acquisition New Zealand gained in Jack Heinemann. This piece, bo be read with his previous two exploding the ‘cisgenics’ rort, places him in the forefront of applied genetics. This card-carrying gene-jockey, a leading teacher of the methods, warns as well as any of the threats from gene-tampering, and joins with those advocating sustainable agriculture instead. As the country’s senior critic of gene-tampering, I rank Prof Heinemann tops. His analysis of ‘GM feed doesn’t modify the animal’ is already standard; his several controversies with gene-jiggerers have generally slapped that well-known kybosh on them. I agree completely with Prof Heinemann’s exposÃ© on the ‘cisgenics’ language-tampering â€“ and on the expectation of no fewer mutations caused by the artificial process. It is a severe worry to me that an eminent expert like Jack can remain ignored by an RSNZ dominated by James D. ‘GenesisÂ®’ Watson. I urge vigorous onspreading of Heinemann’s 3 URLs. I think that Jacks article hit the nail on the head. Nina Federoff made absurd statements in NZ see Farmers Legal Action article http://www.flag-sa.org/blog/rallyround.html. Further Jack was instrumental in pointing out to the INdian government the dangers of insects acquiring resistance to the edible crystal toxin in GM crops. This has been highlighted in Africa where the stalkborer is now resistant to Bt maize. This has resulted in a major ecological malfunction. The Bacillus Thuringienis (Bt) is a bacteria which has existed throughout the world for thousands of years. It plays a vital role in the balance of the ecology of all grasses throughout the world by attacking, inter alia, theÂ vulnerable diapauseÂ larvae of insects hibernating in the dormant dry stalks of all grasses throughout the world. (Diapause is a period of suspended development or growth occurring in many insects and other invertebrates during which metabolism is greatly decreased. )Â â€¨This important bacteria (Bt) secretes a crystal pesticide Â (Cry Toxin) which is toxic to the diapause larvae whilst they are in this vulnerable diapause state. For thousands of years the perfect balanceÂ between grasses, diapause larvae and Bt has existed.â€¨Â For thousands of years no insect resistance to naturally occurring Bt has ever developed.Â â€¨Â Dr Rami Kfir of the South African Agricultural Research Council (ARC) : Journal of African Zoology 107:543-553, prior to the introduction of GM crops, confirmed the high winter mortality rate of larvae of the stalkborer which he attributed partially to Bt which he had significantly isolated, among other pathogens, on the cadavers of diapause stalkborer in the stover (stalks) of maize. Natural Bt spray. Â Decades prior to the introduction of genetically modified (GM) crops, microbial preparations of the entomopatho-genic bacterium Bacilllus thuringiensis (Bt) containing the Cry Toxin were commercially formulated.Â This had numerous applications in the control of insects, but it’s most significant use for the purposes this discussion was that it was extremely efficient as a spray in the control of stalkborer throughout the world. This toxin was particularly popular withÂ irrigation farmers who simply used their overhead sprays to strategically target vulnerableÂ hatching and infantile crawling larvae. A most important, economic factor, is that natural Bt spray is used by organic farmers because it is natural and also biodegradable in water so no residue remains on the produce. Because insects in some areas have become extremely resistant to synthetic insecticides, particularly the pyrethroids, Bt spray has replaced syntheticÂ pesticide in many areas. It therefore has significant agricultural and economic importance. After twenty years of use, no stalkborer resistance to natural Bt spray has developed in any field population of maize throughout the world. (Tabashnik 1994). Bearing in mind that there are two flights of moths each growing season, each moth producing some 1500 eggs, it is not surprising thatÂ during the 2004/2005 growing season an alarming numberÂ reports of severe damage to GM maize cropsÂ flooded in to the ARC.Â What was even more alarming was that they originated from many widely dispersed locationsÂ throughout the country.Â It was not only restricted to Monsanto’s GM maize but to all brands of GM maize. The one thing in common was that theÂ wide spread reports of severe damage were widely spread throughout South Africa and all involved irrigation schemes. As usual, Heinemann is being disingenuous. Genetic engineering and breeding are biological events. Comparing them meaningfully would involve a discussion about the biology involved. Referring instead to patent law and treaties is essentially saying it is possible to legislate biology. Which is not possible, in the current state of the art. The point is illustrated through the example of property rights in agricultural biotechnology, and specifically Monsanto Canada Inc v. Schmeiser. In that case, the Canadian Patent Act was interpreted to bestow expansive IP protection for a molecularly engineered gene, effectively nullifying the farmerâ€™s classic property rights in his plants and seeds.” DeBeer, J. (2005). Reconciling Property Rights in Plants. J. World Intel. Prop. 8, 5-31. My point was that your remarks were about the business model (regardless of the details you bring up), whereas Dr. Dekker’s remark was most likely (almost certainly) about the plants per se and that to my reading you are likely to be conflating two unrelated things. My underlying, unstated, point was that I feel you should have just written about the business aspects without trying to mix in unrelated things. A technological solution can be a powerful tool. When it passes proper testing we should use it. To pass it must benefit the whole ecosystem, be socially and culturally acceptable, strengthen the weakest link in the situation under management, address the cause and not the symptom the problem, be economically sound,and reflect wise use of wealth and energy (Alan Savory, Holistic Resource Management). The problem with the present GM crops is that they do no such thing. They are simply a quick in out for the owners of the patents. A short term fix for the symptoms. A full cost analysis of the destruction to the ecology caused by these crops will far outweigh any seed companyâ€™s claims that they save fuel. There is no artificially inserted gene in any commercial GM crop that improves yield potential or is drought resistant or frost resistant. All this has been bred by farmers over centuries in their specific areas. Experiments with so called nutritionally improved crops are a waste of money. A variety of indigenous vegetables provide more nutrition than these mono-diet solutions. I have yet to see the rural dwelling that does not have a couple of free range chickens running around the place. Jack is quite correct when he brings patents into the equation. Nobel Peace Prize winner, Prof Wangari Maathai, of the Green Belt Movement, Kenya, supports Jacks satetment. â€œHistory has many records of crimes against humanity, which were also justified by dominant commercial interests and governments of the day. Despite protests from citizens, social justice for the common good was eroded in favour of private profits. Today, patenting of life forms and the genetic engineering which it stimulates, is being justified on the grounds that it will benefit society, especially the poor, by providing better and more food and medicine. But in fact, by monopolising the ‘raw’ biological materials, the development of other options is deliberately blocked. Farmers therefore, become totally dependent on the corporations for seeds”. It is significant that the normally pro-GM publication Nature Biotechnology noted how whenever research critical of GM did manage to get published it was met by a wall of apparently orchestrated, ad hominem and unfounded attacks by GM proponents who, in the words of an editor for the Entomological Society of America, “denigrate research by other legitimate scientists in a knee-jerk, partisan, emotional way that is not helpful in advancing knowledge and is outside the ideals of scientific inquiry”. In reply to your second comment that I did not address your first comment: my comment was not intended to be a reply. My comment was to ensure that other readers did not misunderstand my post as being about the general case of patents, since you phrased it as “Jack’s concerns re patents.” I think I was clear in that brief follow-up posting about what I was doing. You seem to be commenting on what you wanted me to do. I hope this clears things up. I hadnâ€™t considered replying because your first comment consisted mostly of your musing about what Dr. Federoff (not sure who Dekker is) was thinking and whether that quote came from a radio interview. Since I linked to the same quote that had already appeared on sciblog (taken from the New York Times) and which you had previously seen and commented on without questioning its context or source, I felt that there was no further need for me to comment. It is easy enough to follow my links and to trace other writings/commentaries by Federoff, so I will leave it to the readers to draw their own conclusions (as Trevor clearly has done!). And I disagree that the issues I raised can be dismissed as simply different ‘business models’ or that I conflate unrelated things. 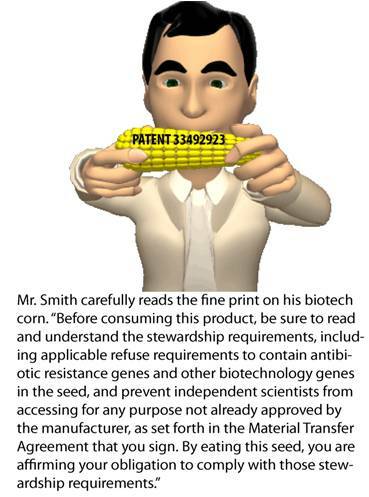 If GMOs are truly nothing special, then they shouldn’t have patent protection because they are not novel. If they are technologically novel and worthy of patent protection, then they should benefit from rigorous safety testing, just as any other truly novel technologies ought to. Are GMOs novel? Then they are not like the products of breeding because that is what novelty means. If you won’t want to provide the context, that’s honestly fine and I guess it’ll stand unresolved. You write Since I linked to the same quote that had already appeared on sciblog (taken from the New York Times) which you had previously seen and commented on without questioning its context or source, [My emphasis in bold.] This is incorrect, offensive and unnecessary. I don’t mind people (nicely!) correcting me if I’m wrong, but there is never a need to caricature someone. My earlier remarks were in reply to farmergal citing a local interview, not the NYT piece. It’s a different quote, from a different source. You won’t know this, but I went out my way to try find the original source of farmergal quoting Dommise quoting Federoff, but could only find a podcast, which as I’ve explained I don’t use. I also went out of my way to make clear what it is that I know and I don’t, as I usually do. The article that Trevor links not contain either quote, nor should I really be “expected” to have read his linked article. Other writing by Dr Federoff is besides the point as I was writing in reply to the specific quote you gave. The NYT source reads quite clearly to me as her referring how plants are genetically modified in any form of breeding as I described earlier. I left my original comment open-ended I was just giving you the opportunity to clarify this yourself, as kindly as I could, given that you’re a risk of misrepresenting what someone else has said. (My gentle approach wasn’t me “musing” to myself: it was me trying to be kind to you rather than bluntly say “you’re misrepresenting Dr. Federoff’s words.”) I really don’t understand why you don’t just clarify it. It takes nothing away from the main point of article, being your concerns with the business models, as it’s not related to it. The 3rd word of Jack’s article is a hyperlink to another sciblog article (by Peter Griffin, 2010) referring to Dr. Federoff’s as saying – â€œThereâ€™s almost no food that isnâ€™t genetically modified. Genetic modification is the basis of all evolutionâ€ in a NYT interview (by Claudia Dreifus, 2008). You say you were offended by Jack saying – “Since I linked to the same quote that had already appeared on sciblog (taken from the New York Times) which you had previously seen and commented on without questioning its context or source”, and, in your opinion, his statement was incorrect. Possibly this is why you thought his comments to be offensive? Just look again, he is not incorrect. All he is saying is that you had seen this quote before, because you had commented on Griffin’s 2010 article. Peter Griffin (2010), https://sciblogs.co.nz/griffins-gadgets/2010/01/29/us-to-nz-get-real-about-gm-crops/, Date Accessed 2010-02-18. I’m aware of where the quote comes from and it’s previous use, etc. I take you to mean well, but to read Jack’s words as you suggest, you’ve got to add intended meanings that have accidentally lost. That happens to the best of us, but his sentence as it stands has “previously seen and commented on” referring to “the same quote” not “the NYT article” or “Peter’s previous article” as you suggest (neither or these appear in his words). If the latter of the meanings are his intended meanings then I apologise, but in my defence it’s not in the words in the words he wrote. Irrespective of whatever people make out that sentence to mean, it leaves my original point standing. It’s immaterial if I’ve seen the quote before in another context, really: I was pointing out thatâ€”IMHOâ€”I don’t think the context he has placed it in his article reflects the original intention. I’m not being naÃ¯ve as some commenters seem to want to imply. I’m not avoiding the business models, etc., through ignorance or wishing them away, but because it’s not related to my point, which isâ€”if anythingâ€”just a general point about better journalism and clearer argument. There’s a danger of “reading meanings” into things when you conflate one thing with another. I personally think that the business issues are better treated as business issues on their own, away from the “emotive junk” of the GE/GMO debate. As far as I can see, they’d stand quite comfortably on their own and I think it’d be better, clearer and less emotive for that, too. I can’t see any point in further elaborating on this as it seems to me that people aren’t trying to “get” my much simpler meaning and are confusing it with more complex ones (and slightly conspiratorial ones!) that suit their own wishes, rather than my meaning. Our farming family fully endorses Robt M’s comments regarding the critical role Prof Jack Heinemann and the Centre for Integrated Research in Biosafety plays in NZ. It is a relief for NZ primary producers to be able to rely on the advice of a NZ scientist of integrity who is committed to truly sustainable farming (agriculture/horticulture/forestry etc). -ongoing misinformation (ie. in the recent edition of the NZ Farmers Weekly) by William Rolleston of Timaru, former PR man for the “NZ Life Sciences Network”. He continues in vain to sell us a pup- undesirable GE crops. the performance of ERMA and MAF as regulators has hit an all time low. â€¢	To protect, in collaboration with others, the health and safety of people in Australia and New Zealand through the maintenance of a safe food supply. I note that all NZ GE field trials so far have come to nothing and have therefore been a complete waste of taxpayer money. They have all been either shut down (like Crop & Food’s GE brassica trial), or have petered out without any worthwhile results. As GE Free food producers, we can and should remain critical about the outdoor use of GE crops in agriculture. It is a stance that has been hard won and is vital to smart decisions about sustainable food production and our standing in the world. As a Northland primary producer, I would like to thank Professor Jack Heinemann and our nine council strong “Inter Council Working Party on GMO Risk Evaluation & Options”, for their vigilance and committment to protect our valuable GE free status. Firstly, this application is number ten submitted by AgResearchâ€™s transgenic livestock programme, which began in 1998. Since that date, five of the ten applications have been sent back by the courts, one has been withdrawn, and this current one is awaiting a public hearing . This application is extremely similar to four recent applications [GMC07012, GMD07074, GMF07001, GMD08012]. The High Court declared these applications invalid as they were considered too generic to enable the risk assessment required by the Hazardous Substances and New Organisms (HSNO) Act 1996 [see GE Free NZ in Food and the Environment Incorporated v Environmental Risk Management Authority (5 June 2009) HC/09, Clifford J; and Table 1 (attached)].